Credit Library of Congress Prints and Photographs Division, photographer unknown. I could not write articles about vintage radio without including Atwater Kent, both the man and his radios. He is a legend among vintage enthusiasts and radio collectors, revered with near deity status. Arthur Atwater Kent preferred not to use his first name and to be publicly known as Atwater Kent. He was born in Burlington, Vermont, on Dec. 3, 1873, to Prentis and Mary Atwater Kent. He enrolled at Worcester Polytechnic Institute in the fall of 1895, majoring in mechanical engineering. He left after one semester due to poor grades. He re-entered a year later, only to fail again. Poor academic performance did not prove to be a hindrance to the young Mr. Kent, however. By the end of his life, he would hold 93 patents for his inventions. Within a couple of years of leaving school, he started the Atwater Kent Manufacturing Works, at 48 North Sixth Street in Philadelphia. He manufactured batteries, electric motors and fans, and other sundry items. Although Atwater Kent is a name well known to the vintage radio enthusiast, prior to going into the radio business he gave the world two inventions that almost everybody uses every day. One was the beaker point automotive ignition system (patented as the "Unisparker Ignition"). This revolutionized the performance of the gasoline engine with its precise and controlled firing of spark plugs. It was used mostly unchanged until the modern computer-controlled version replaced it in the 1980s. The second invention was the fuel gauge, first a mechanical design, and then the electrical gauge that we are all familiar with today. By 1912, the demand for these items alone required a larger factory to be built. His second factory was located on Stenton St., also in Philadelphia. 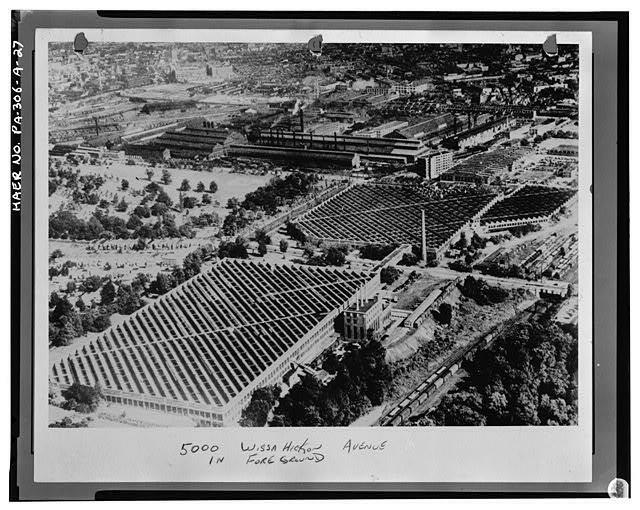 The final Atwater Kent radio factory, covering more than 32 acres, circa early 1930s. The sailing ship logo was used throughout most of the company's years of operation. Ironically, or perhaps not so, Worcester Polytechnic Institute honored the two-time college drop out with an honorary doctorate degree in 1926, and placed him on their board of directors for several years. They also named an engineering building after him. The company remained privately held and not invested in the stock market. It was not immediately affected by the market crash of October 1929. This was however, where the self made entrepreneur would run into a brick wall. From the beginning, Atwater Kent's stated goal was to produce the finest radio sets on the market and, arguably, he achieved this. Bottom of an Atwater Kent Model 55. Pictured here is the underbelly of a 1929 Atwater Kent Model 55. 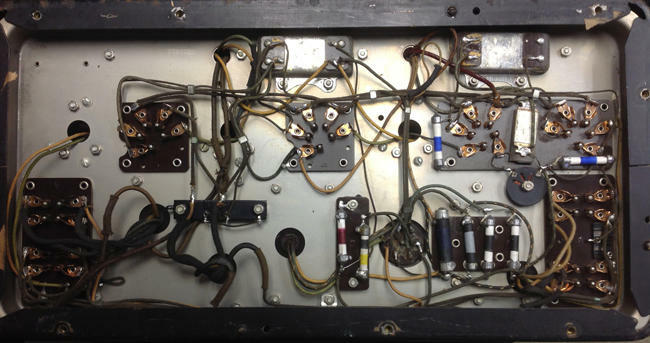 The wire dressing techniques and craftsmanship are typical of what one would find in military grade radio equipment of the time period. 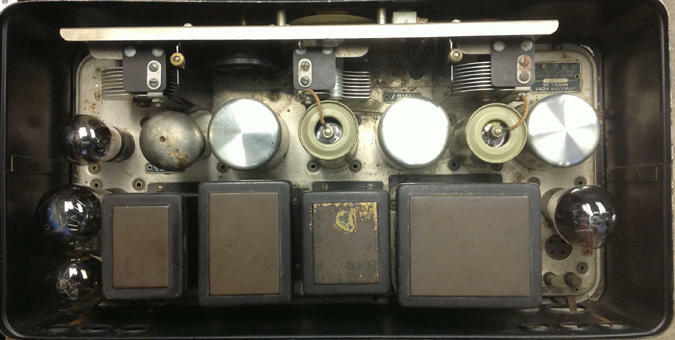 Note that components, such as resistors, are mounted on plates that are secured to the chassis with rivets. To the right is the top view of the chassis, showing the neat and sturdy layout of components, with covers and shields in place, to maximize stability and minimize noise pickup. The majority of Atwater Kent radios still work when powered up today with little or no repairs required. When most manufacturers sought ways to produce lower cost radios that consumers could afford in hard economic times, Kent could not bring himself to follow suit. By the mid 1930s, most companies paid royalties to RCA for the use of their heterodyne circuit patent. The circuit could be used to produce powerful, sensitive radios at a fraction of the cost of older technologies. 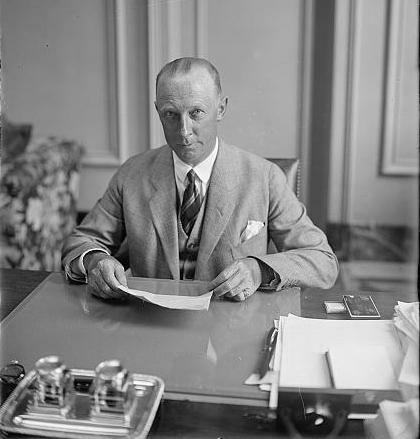 Atwater Kent had outright disdain for the concept of paying his largest competitor for the rights to use the RCA circuit. He was also quoted as refusing to produce what he referred to as "cheap, low quality radios." His refusal to adapt to changing times would eventually become a contributing factor in his decision to leave the radio business. Near the end, he did give in, and produced several models using the RCA patent. Even this was done to utilize the heterodyne circuit's superior performance, not to reduce the cost of the set. The radios were still made from only the highest quality components and craftsmanship and sold for substantially more than a depression economy would support. Top of an Atwater Kent Model 55. For reasons not fully understood, but clearly under pressure from the economy and from labor unions attempting to unionize his factories, he simply chose to close his operations in 1936, putting thousands of Philadelphians out of work. He himself did not lose his fortune. He retired, living out his life between his mansions in Philadelphia, Maine, and California, where he was said to have thrown lavish parties for the social elite. He passed away after a brief illness in 1949. In the relatively brief 16 years of its existence, the Atwater Kent radio company turned out more than 150 distinct models that I have been able to identify. Of these, many had several variations, such as different style cabinets or optional features. They also produced thousands of accessories, such as antennas, speakers, and power supplies designed to operate the radios at foreign voltage standards. From here, let me wax poetic and speculate as to what might have been. Atwater Kent was a very private person. Not much is known as to why he decided to do what he did. It is well documented that he refused to compromise the quality of his radios or his company's reputation. Others suggest that after years of treating his employees fairly, that he was not about to let labor unions dictate company policy. You cannot fault him from retiring while he still had his fortune, a feat that few others in the great depression could achieve. At the time of the market crash, he was the largest radio manufacturer in the country. By 1936, several of his major competitors, such as the Grigsby Grunow Company, and countless smaller radio manufacturers had folded. Had he reduced the scale of his operations and mothballed some of his factory space for a few more years, he would have been in a prime position to profit highly from contracts producing radio equipment for the government during WWII. No other company had a facility of that size at the time, or the ability to produce almost all of the components needed to produce a radio under one roof. In the end, Atwater Kent might have emerged as a corporate giant after the war. If a different course was taken, perhaps that 60-inch flat panel TV hanging in your living room would have a sailing ship logo on it. After shutting down the radio factory in 1936, a competitor, The Philco Corporation, purchased one half of the factory and built refrigerators in it. It has since been torn down. The other 15-acre plant still exists and has been redeveloped as an enterprise park for smaller, start-up businesses. The legacy of Atwater Kent and his radios lives on. The radios are highly prized by collectors and fetch a premium price. Kent also gave money to build the Philadelphia History Museum, which continues to thrive. I'll leave you with a few comments on the Atwater Kent Model 55, which was available in several different cabinets, including the parlor table that I featured in my April 2014 article on radio cabinetry. The pre-depression set sold for $175 in its basic form, more for fancy cabinetry. This radio is, in my opinion, one of the finest three-stage tuned radio frequency sets ever made. I acquired my first one in the late 1960s. I found it, along with the very old kit radio that I featured in my October 2013 article, on a "spring cleanup" week junk pile, in Stratford, Connecticut. At the time, the yearly bulk pickup week was an almost unlimited source of vintage radios for a kid just getting started in the hobby. The radio worked as found, and when hooked to my long wire antenna, I was surprised at how it vastly outperformed any other radio that I had, even modern ones. Model 55 through 55F were produced in large quantities, and are still easy to find on the collectors market. I highly recommend this radio as both a work of art and a great performer, as an addition to any vintage collection.